MESA, Ariz. — Yu Darvish walked up the left-field line on Thursday afternoon with Texas’ Shin-Soo Choo to his right and Delino DeShields trailing just behind. DeShields playfully kicked at Darvish’s equipment bag, which hung from his right shoulder. Darvish had a playful jab of his own for the Rangers outfielder. Given the roster makeover Texas has undergone over the past couple of seasons, there are not as many ties as there used to be for Darvish. The split-squad Rangers team he faced in Thursday’s 2-1 victory was mostly unfamiliar, as will be the lineup Darvish might take on in the Cubs’ season-opening series at Globe Life Park in Arlington. 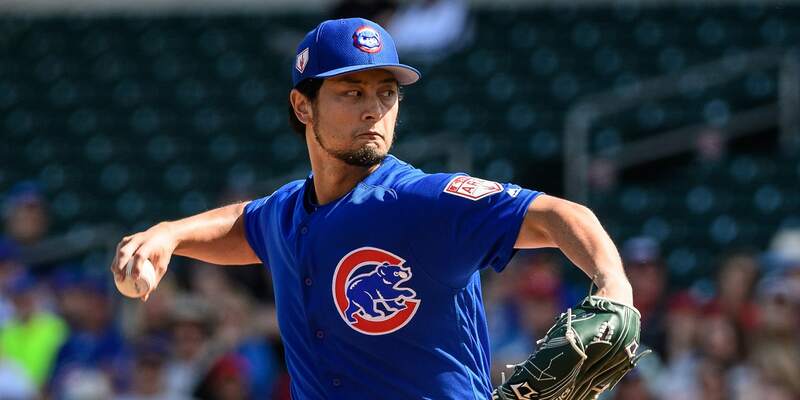 Darvish, who spent parts of six seasons with the Rangers after coming over from Japan prior to the 2012 campaign, has been lined up as the Cubs’ No. 2 starter throughout the spring schedule. Due to a pair of off-days in the season’s first six days, manager Joe Maddon has only announced that Jon Lester will take the ball against Texas on Opening Day (March 28). Asked if he hopes to get the start on March 30 or March 31 in Texas, Darvish smirked. “Up to Joe Maddon,” he replied. The good news is that the Cubs can realistically discuss that scenario with two weeks left in the preseason slate. Darvish was limited to eight starts last year due to arm troubles, made his final start of ’18 with Class A South Bend on Aug. 18 and then went under the knife for a right elbow debridement on Sept. 12. He encountered no setbacks in his rehab and came to Spring Training with no restrictions. Dating back to Darvish’s early-spring bullpen sessions, it was clear that he is healthy. He has been hitting 94-96 mph consistently with his fastball and has held steady in that regard over the past few weeks. That power was there again in four-plus innings on Thursday against Texas, but the command went missing early. He said it was a good test for in-game adjusting. Over his first five batters on Thursday, Darvish threw 13 balls against 12 strikes. His tempo was noticeably slow, and Texas took advantage with a pair of singles, a walk and one run scored. Pitching coach Tommy Hottovy jogged out to the mound with two outs, and after a brief chat, Darvish looked like a different pitcher the rest of the way. After Hunter Pence’s RBI single in the first, which prompted Hottovy’s visit, Darvish threw 31 strikes in 46 pitches (67 percent) in a 13-batter run. He focused more on his slider, mixed in some splitters and changeups, and relied less on the errant fastball. He took the mound for the fifth, issued a leadoff walk and was pulled with his pitch count at 76 (44 strikes). In all, Darvish struck out five, walked two and hit a pair of batters (Carlos Tocci and Isiah Kiner-Falefa). After logging a four-inning simulated game last Friday, Darvish joked that he wanted to hit former teammates Joey Gallo and Rougned Odor with pitches during the opening series in Texas. After Thursday’s outing, he was jokingly asked if he’d targeted Tocci and Kiner-Falefa since his old friends were not in the lineup.